2. Peter is setting a new paradigm for bike manufacturing and value proposition. He is a visionary. But a visionary that actually could execute. The complexity of the project is far far beyond what I (any probably anyone else including Peter and team) ever imagined. But it worked. You have to be privy to the supporter forum to grasp a bit of the complexity. 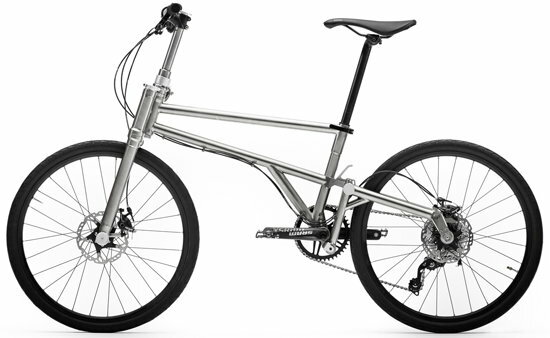 It does require a totally a new paradigm for bike manufacturing and value proposition to build titanium folding bike at that low price, and that is the exact reason I don't believe in him. Two million dollars may sound a lot but it isn't, at least in first world countries. And it has been THREE and a half years since the funding ended. If his team consists of only 6 people with average yearly wage of $10K, he had to spend all the money just for the wages. Which means that his team (or full time employee) cannot be more than a handful... and I don't believe such a small group can make "a new paradigm for bike manufacturing and value proposition". And delivering a small batch of bikes does not prove that his business model is sustainable. Ponzi scheme works for early investors too. Ultralight, this is a new bike company, not a religion. The bike either sells or is doesn’t. There.´s no new paradism, except, perhaps, in the fact it took ttwice the normal time from development to production. There is another factor. I see no difference between this and other folding bikes, other than the bike does not fold to a size smaller that its wheels. In fact, there seems little difference between it and other folding bikes. The biggest problem, however, is timing. I may be wrong, but it could be that the time for folding bikes has either entered a lull, or the market is nearly saturated time. I hope you enjoy your bike, and wish the producers well, but try to keep some perspective. ETRTO 507 wheels for folders has already be done and is not widely used because it is a drawback and not a benefit. The folding method isn't new either, there are other folders with similar folding (Tyrell for instance). Titanium is also not new for a folder. The only thing really different is the price, let see if Peter is able to produce the 1000+ bikes for the backers. As Raxel says, 2 million is not a lot when there are 1000+ bikes to build with that money. And indeed, more than 3 years after the end of KS campaign, the market has changed, the demand for folders is stagnating, the market is now looking for electric assist folders. For remembrance, Brompton CEO promised to double the sales when Brompton moved to its new factory. This didn't happen, Brompton sales are stagnating a little below 50K pieces/year.. The official picture shows the three founders standing by five folded bikes..., the folded bikes look good.... Avner. Is it possible to save the picture to your BF account or devise and then post it here? Those of us who follow along without comment or opinion would enjoy looking at what has been accomplished. Thanks! This is a picture from their website, but my assumption is it is one of the prototypes, and it shows the non drive side. 6 people * 10.000$ * 3,5 years = 210.000$. He got more than 2.000.0000$ (CAD, to stay fair). Something ist seriously wrong with your math. Other than that he did not have 6 people, for a very long time he has been on his own as far as I know. You may not believe in the product but it is a difference to not believe in something or to bluntly lie in plain simple ignorance. I meant 100K, not 10K. 10K/year is way below the minimum wage of most first world countries. As of 2017, the average wage for Canadian employees was $51K a year. I think seasoned professional will cost much more than that. My calculation is still valid. Last edited by Raxel; 02-11-19 at 09:18 AM. Well, the 10k-claim/assumption came from you... Let's take the 51k then: For at least 2 of the 3,5 years he did not have employees as far as I know. Probably he did not pay himself a wage. I do not know how big his team is and how it grew. Let's assume your 6 people as current and possibly less before the actual "completing the bikes" phase started - 2 people? Maybe one of the backers can help out with the correct numbers. Assuming your average wages to make it easier: 1,5 years * 2 people * 51.000 $ + 0,25 years* 4 people* 51.000 $ = 175.000$. Maybe a specialist may cost more than 51k, a shop hand on the other hand may cost less. Plus in a startup typically there are lower wages than average. So you would overall be still at far less than 10% in wages of the money he collected, even based on your "average wages". If I remember correctly the topic already came up in this thread sometime somewhere and was possibly discussed more or less in depth. Even 6 people at 51k$ each for 3,5 years would equal 6*3,5*51.000$ = 1.070.000$ - about half of what he got in backings and definitvely far more people in your assumption than he employed in reality. Fascinating how you still believe the whole thing would be a scam though the bikes get actually delivered right now... Your calculation is btw. based on wild assumptions wich I would not dare to call "valid". And I would neither give a damn about them as reality seems to prove that they are wrong and - far more important - irrelevant as reality has overtaken you by miles. Last edited by berlinonaut; 02-11-19 at 10:05 AM. Well, the 10k-claim/assumption came from you... Let's take the 51k then: For at least 2 of the 3,5 years he did not have employees as far as I know. According to his timeline, he should have started setting up the factory / adjust component / adjust design by September 2015, which all need manpower. What have he done for two years then? Let's assume your 6 people as current and possibly less before the actual "completing the bikes" phase started - 2 people? What I am saying again is that such a few people cannot make "a new paradigm for bike manufacturing and value proposition". Plus in a startup typically there are lower wages than average. You need to pay enough to hire good people, whether it is a startup or not. He still need to get the equipment, lease the space, buy parts for >1,000 bikes, make the frame, assemble the bike and ship them with the money. Fascinating how you still believe the whole thing would be a scam though the bikes get actually delivered right now. Delivering a handful of bikes does not prove that his business is actually sustainable. Last edited by Raxel; 02-11-19 at 10:48 AM. Why do you care so much? The bikes are being delivered. Let the bikes be tested in the real world and assuming they pass muster, let the Helix team figure out if all their efforts/sacrifice/magic pixie dust can be harnessed into a viable business model. Maybe you should watch out for the early teams of Apple, Google, Facebook or any other company that came out of a garage in the last 50 years. Or look how "big" Brompton was in the early 90ies regarding the number of staff.... You are really making a fool out of yourself with your statements. There was a calculation about the cost of materials somewhere in this thread quite a while ago if I remember correctly. Totally feasible. Regarding the money: Definitively he got additional money via preorders, possibly he invested own money as well and maybe he got other sources additionally like i.e. governmental support for founders, a silent investor or whatever. Honestly: Why do you care? And why do you speculate so heavily w/o any knowledge or evidence? Time will tell. How come that you are so begrunding and distrustful instead of being happy for the backers that they finally get their bikes delivered after such a long time (and for Peter to have made it to the finish line)? Did you not back the campaign back then because of distrust or meanness and are now jealous that you will not get a Helix below the market price that you are going as berserk as you do? You really show a very strange behaviour. I just SCANNED through my email with weekly update from this thread. Did not read it all. 1. Peter's clarity of vision is what gave me assurance that this project will be completed so I invested in multiples. 3. I believe that the Helix will put a lot of pressure on other high end manufacturers such as the Brompton mentioned in these threads. It really is a fresh paradigm. 4. His perfectionism did delay the bike, but was welcome by some including myself. I am unlikely to repurchase it in the future if the first iteration worked poorly. 6. Durability should be excellent - it is actually overbuilt and the later bikes will eventually be a bit lighter. Peter sent just one sample (instead of multiples as of parts as is customary) of each part to be stress tested to industry standards far beyond the norm. 9. I did wonder publicly if Peter's forum short snippets revealed a lot to his competitors who may seek to emulate his approach - perhaps, but apparently one of his secret is finding people who are top in their field to be on the team. Great people are hard to find. 10. There's a certainly humility and strength of character about Peter (and his wife I'm sure) as I read his updates. He has been wonderfully unruffled by some strong words sent his direction. The above just the top of my head. I don't really follow this forum much anymore since I ordered the Helices ( ) as I found my lifetime bikes so if you send me queries, I may not see them. .
Maybe you should watch out for the early teams of Apple, Google, Facebook or any other company that came out of a garage in the last 50 years. Or look how "big" Brompton was in the early 90ies regarding the number of staff.... You are really making a fool out of yourself with your statements..
University-based software startup is totally different from hardware startups because they need almost nothing. Hardware startup is vastly harder to maintain, especially if you do not outsource manufacturing. That's why most of the KS hardwares end up vaporware, or arrive too late and too expensive. Also Brompton did not promise massively cheaper price as Helix did. On the other hand, Brompton are still many times more expensive than its peers. Why do you care? And why do you speculate so heavily w/o any knowledge or evidence? Because it doesn't make any sense. If they can really make titanium frames at such a low price, they can instantly get tons of money by making road bikes and mtb frames first - which are vastly easier to build as well. Because a) they are making totally outlandish claims b) they missed the delivery date by THREE years c) they are extremely secretive about what they are doing. "Extraordinary claims require extraordinary evidence" said Carl Sagan. Helix did NOT want to make road bikes or MTBs: that wasn't the point. The founder wanted to build a better folding bike - maybe to prove a point. Haven't you ever done or experienced something and thought, "Cripes, I can do THAT better!" Why do you think everybody on this forum was going bonkers when this thing was proposed? Because it was a better mousetrap. Just because there are easier paths doesn't mean everybody is going to take it. Not everybody wants more road bikes or MTBs. Does the world need more mousetraps? No, but that isn't the point. It's a free world: he wanted to build a near impossible folding bike - let him try. Outlandish? It would be outlandish if the bike never materialized. It did. Will it succeed as a business? Who knows - let them have a go at it. Are you a business consultant for start ups or something? Three years late. Yeah.. that's Kickstarter. You pay your money, you roll your dice, you take your chance - win or lose. If anybody went in thinking they'd get was promised in record time, they'd be a fool. Secretive? Bloody why not? Do you want your idea ripped off? And backers got updates - sometimes very detailed updates - once Helix had its gears (pun intended) up and running. Why should Helix give out what they're doing to non-backers or non-investors? If you didn't put your money down, you don't have the right to know what's going on. We're not talking about national security. It's a BIKE. And if you didn't invest in it, why do you even care so much? I'm still waiting on a crowdfunded project and it's been longer now than Helix!!! It's coming, I've seen definitive proof, but that developer also kept everything very secretive until all his patents were fully filed and approved. Even with that, he's not putting out too much technical data, more info just about visual appearance and operational functionality - but the deets on the tech side very rightly are being kept quiet. Project updates are emailed to paid backers only. After working so long and so hard, these developers do not want to get ripped off by copy-cats. The Helix developer seems to know what he's doing in this regard and it is not at all suspicious. His claim is that he can build titanium folding bike in first world country at a fraction of the cost Asian OEMs can. If he can really do that, he can totally disrupt bike industry and make a ton of money easily. Then why did he use KS at all? The outlandish part is the claimed PRICE of the bike. It is so much lower than what others can. Delivering a few bikes does not prove that he can make >1,000 bikes and still make profit. Secretive? Bloody why not? Do you want your idea ripped off? They already released detailed photographs of the bike, and that is more than enough to copy it. But no one ever tries to copy one, because even a Chinese copy will be much more expensive than the claimed price of the bike. And if you didn't invest in it, why do you even care so much? Because I smell a lot of BS. So? Almost nothing you argue has not already been rabidly discussed in nauseating detail in over 60 pages on this thread. YOU smell BS - exactly how is that furthering discussion? You have some inside knowledge no one else has? If so, since you seem so devoted to transparency, then please do share. Many hope this will succeed; nobody is so deluded into thinking it is guaranteed to succeed in the long term - that remains to be seen. Negative speculation is just as pointless as positive speculation. The bike is now out in the wild and the company is ramping up to deliver the goods. Let it happen. If the bike is as good as it claims, the market demands it, and if the Helix team can deliver it, it'll be great. If not, then it will join the millions of other well intentioned but failed product attempts. It's a BIKE. Last edited by Ozonation; 02-11-19 at 10:10 PM. Has anyone seen this bike yet, as in on the street, rather than a photo from a studio? Probably not. The first five bikes were apparently shipped the other day, so that's presumably the first five Kickstarter supporters. Will take a few days to ship and probably another day or two before anybody posts any sort of first impressions. Raxel. you should look at the history of the project from the beginning: originally, the Helix frame was build by an experienced Canadian titanium parts manufacturer, Peter wasn't considering to setup his own factory for the frame manufacturing. This came much later in the project after the failure to find any sub-contractor willing to build the helix frame (I suppose willing to build the Helix frame at a price compatible with the announced price of Helix). But you are right when you say that the only USP of this project is the extraordinary low price of Helix, all the other claims, Smaller, Lighter, Safer, Easier to use, are pure marketing bull****. (BTW, the benefit of titanium is also partially pure marketing, titanium is a very good material for bike frame but there is no magic in titanium, it has also its limitations and drawbacks) and therefore shipping a small amount of bikes doesn't mean that the project will be successful i.e. that Peter will be able to build the 1000+ bikes of the KS project. Besides the wages for the people, there are also the costs of the manufacturing factory that was absolutely not foreseen in the original KS project and therefore these costs were not taken into account in the estimation of the Helix price for the KS project. The costs of the people and the factory must have been forseen, just expected to have been paid to a manufacturing partner who would bear these, rather than spent in house. The cost of setting up a factory and manufacturing processes would also have to have been considered, but they would not have accounted for that being from scratch. So some saving on manufacturing partner margins set against increased development costs. Ti tubing and most parts seem to have been purchased at the outset. We have covered this before but as far as we can see, Helix has never employed more than two people excluding founder and family until they were ready to begin assembly. Initially it was junior design support resources. Later these were replaced by a master welder and a master machinist. It has been stated that much of the factory equipment is leased and that equipment providers have provided expertise at points. As has been posted previously, there has been some additional funding declared. Helix have offered reassurances that the existing funds are sufficient to fullfill all back orders. We don't know how much the cost per unit of the bikes is. The unit cost will depend on volume throughput that can be acheived against the fixed overheads and variable costs and on volume of demand in due course. Helix seems to have been pretty consistent in their target price throughout. Based on the evidence backers have seen, i can be reasonably confident that the factory exists and has the capability to produce finished bikes. It remains to be seen if Helix can and will deliver all back orders and run as a successful business. Any opinion either way is conjecture. Some opinions seem less informed/reasoned than others. Helix set out to build a Helix. As often happens, in that journey they have developed unplanned new capabilities and IP to acheive their goals within the original parameters. You are right to note that those capabilities now represent a number of opportunities for Helix to disrupt other parts of the market and make more good money. Those opportunities will take time and money to develop to fruition and may be realised in due course. In the meantime, Helix seems, to their credit, to be focussed on meeting their commitments to those that funded them by delivering Helix bikes and establishing that as a business. Could not disagree more. The design is unique in all sorts of areas individually (folding mechanism, locking mechanisms) and in combination. In 2019--- will Helix become--- what DeLorean was--- in 1981? Or--- will it become the next Tesla Roadster of 2008? Who knows, one day it might end up in a leisurely orbit around the Sun. Gibsonsean, as a big Helix fan, what are your thoughts about the worrying thought they might have missed the market? Bigger wheel size: there are few other folders with same wheel size (but that accepts the normal ETRTO507 tire size what Helix doesn't), not widely used because useless, only drawbacks. ETRTO 507 wheels is well known, any manufacturer can use that size, do you really think that all other folders manufacturers that use ETRTO 406 wheels are stupid ? Moulton demonstrated that even smaller ETRTO 369 wheels perform very well with an adapted frame. Folds essentially to the size of it's wheels without any disassembly or detatchment of parts: useless, the wheels are too big, other folders are smaller folded than Helix. Rolls on it's wheels whilst folded: several others folders roll folded better than what Helix will do. Weighs 10 to 12 kg: other folders (including the Brompton) have the same weight with the same equipment, some weight less. Note that the weight of Helix must still be proven, manufacturers very often announce underestimated weights. All these claims are pure marketing, nothing technically valuable. Same as the claims " Smaller, Lighter, Safer, Easier to use, " no, it isn't smaller, no it isn't lighter, no it isn't safer, no it isn't easier to use than other folders and than a Brompton for instance. Moreover, Helix doesn't address one of the main weak points of the Brompton which is comfort (due to the relatively narrow, high pressure tires and poor rear suspension) because Helix has no suspension and has also relatively narrow tires (and please do not come to explain me that a rigid titanium frame and that ETRTO 507 wheels will make Helix comfortable , as an owner of a ETRTO 622 titanium high end bike, I can tell you that it isn't true).